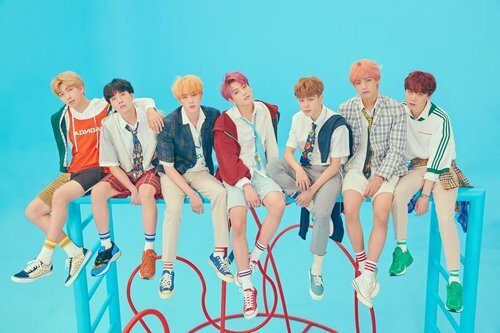 Twenty-one of their videos on YouTube have earned more than 100 million views, with the music video for their "DNA" receiving 650 million views. It's clear that BTS has already become a worldwide famous symbol of South Korean pop culture. According to a people.cn report on February 20, BTS will kick off its Love Yourself Speak Yourself tour in May. The tour will see the band perform 10 concerts in cities including Chicago, Sao Paulo, London and Osaka. Although the band held a concert in Hong Kong in 2017, China is not currently on the tour list this time. However, according to a Bloomberg report, the band and their Chinese agency are working on getting approval to perform in China. After South Korea adopted the THAAD missile system, tensions between it and China increased. Some analysts believe that cultural and entertainment exchanges might be effective means of resolving diplomatic issues between the two countries. Not only are the two countries close to each other both geographically and culturally, China also has a huge number of fans of South Korean pop culture. Like other countries, the BTS fan base in China has been rapidly growing over the past three years. In June 2018, the band had about 1.34 million followers on Sina Weibo. Today, that number has almost tripled to reach more than 3.6 million followers. "Pretty boys and girls. It was all novel to me at the time," Zhang Ziwei, a 24-year-old fan of South Korean boy band NCT in Guangzhou, shared her first impressions of South Korean stars and idols when she first came across them 11 years ago. "I think their songs are really exciting and have a good beat. Western people like them. They also owe their popularity to the predecessors who paved a path for them, like Big Bang," Zhang told the Global Times. "Hallyu," or the Korean Wave, dates back to 2003, a time when K-pop group TVXQ gained fame and commercial success throughout East Asia. In 2004, the band made their Chinese mainland debut in the Great Hall of the People in Beijing. Although Chinese stars like Jackie Chan and Chow Yun-fat are hugely popular in South Korea, more and more Chinese entertainers have started heading to South Korea for training and to start their careers since Chinese entertainer Han Geng made a name for himself after joining South Korean boy band Super Junior in 2005. Chinese pop stars like Lu Han, Zhang Yixing, and Kris Wu also started their careers in the popular K-pop group EXO, where they earned fans in both China and South Korea. South Korean singers like Hwang Chi-yeul and The One also got their start in the Chinese market after appearing on Singer, a Chinese remake of a South Korean TV reality series. "I really want to travel to South Korea, especially the place they (the band) shot music videos. We fans call it our 'holy place tour.' Actually, I did visit South Korea last year, but I didn't visit those 'holy places,' instead I tried the fried chicken that I saw on a South Korea TV drama that made me really hungry," Zhang said with a laugh. "I learned some Korean just so I could better understand their TV shows," Zhang said. "I know there are many other fans who speak better Korean than I can who volunteer making Chinese subtitles for South Korean TV shows." This exchange of culture swings both ways. Yang Won-suk, 25, a South Korean student studying English literature at Nankai University in Tianjin, said that living in China is very comfortable for him. "I am not an expert in stars or idols," Yang said, "but I know they are a cultural thing." "China is second home to me. The food is tasty and the people are really friendly," said Yang. "And we are similar to each other in many different ways, we have almost the same pronunciation for many words," said Yang, who can write and speak Chinese. There are many South Koreans who have come to know China by following Chinese idols. According to Zhang, her idol Dong Sicheng, a Chinese member of the K-pop boy band NCT, has a lot of South Korean fans who are proficient in Chinese on Sina Weibo. One time, after the star posted a picture of his family meal from Chinese New Year's Eve, many South Korean fans began showing an interest in traditional Chinese culture. South Korean netizen @ilsamooh posted on Twitter that she began reading Chinese novel To Live by Yu Hua because of Dong Sicheng. "It's really hard for me to understand… if it weren't for him, I am not sure if I would have tried reading Chinese literature." Although young Chinese today are more active and open when dealing with different cultures, this ready acceptance of South Korean pop culture seems to have more to do with the similarities between China and Korean culture. "Compared with the culture of Japan, I prefer pop culture from South Korea. Japan is not as open as South Korea. Can you believe that Johnny & Associates, one of the top entertainment companies in Japan, only just opened a YouTube channel last year?" Zhang told the Global Times. "As for Europe and the US, I also like Korean culture more. We are all Asians, and we all eat white rice."